A handheld electronic magnifier provides adjustable magnification to a much higher power that makes it possible to read - anywhere. If you find that a regular hand held magnifier does not provide you with enough magnification, it is time to change to an electronic magnifier. 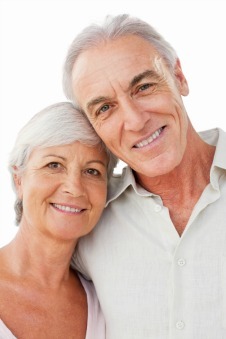 Adjusting to vision changes as the result of macular degeneration is a constant process. Reading is one of the tasks that becomes the most difficult for those with macular degeneration. However, there are many helpful low vision aids that will help you to continue reading - whether it's books, magazines, newspapers, utility bills or recipes. An electronic magnifier can offer a higher power of magnification than what a large magnifying glass can and a larger viewing area. Designing the industries leading low vision magnifiers, Enhanced Vision offers a comprehensive line of electronic magnifiers. The Pebble HD, is one of many low vision magnifiers made by Enhanced Vision. This handheld electronic magnifier is lightweight and can be carried in your pocket, your purse or strapped onto your belt. The handle easily folds up so that it can be used as a portable or pocket magnifier. A handheld electronic magnifier will help you with spot reading. 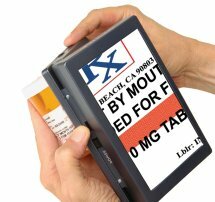 Use it to read magazines, price tags, newspaper articles, menus, bills, labels, instructions or anything with small print. It can be used as a photo magnifier to view your latest pictures or pictures from your family. √ Viewing area of 4.3"
Such as white print on black background, yellow print on blue background, yellow print on black background, etc. The Amigo is a larger, yet portable handheld electronic magnifier. The screen is 6.5" for the Amigo and the largest Pebble has a 4.3" screen. The adjustable magnification range for the Amigo is 3.5X- 14X. The Pebble offers 2X - 10X magnification. These high powered magnifiers are carried by many low vision stores and endorsed by eye care professionals throughout the United States and other countries. "Enhanced Vision has an amazing ability to produce quality products that really meet the needs of low vision people in the real world. Their products are effective and set the standard for affordability. I whole heartedly applaud their great contribution to the field of Low Vision Rehabilitation." How will you know if you will benefit from a handheld electronic magnifier and if the added expense is worth it? Would you like the convenience of having someone come to your home to show you how these low vision magnifiers work and more importantly show you how they can help you or your loved one? The best way to answer that is to try one. A representative from Enhanced Vision can come to your home so that you don't need to drive anywhere. They will provide you with an in-home demonstration of their portable magnifiers and their other low vision magnifiers. I made an appointment myself. I do not have macular degeneration but I wanted to find out more about Enhanced Vision and their products. My call was promptly returned and an appointment was made that was convenient for me. James Bailey, the representative for my area, came promptly at the appointment time. He was very knowledgeable and professional. The products were demonstrated for me without any pressure or obligation to make a purchase. I found the electronic magnifiers are very easy to use and offer so many more benefits over a magnifying glass. The demonstration is free and there is no pressure or obligation to buy any of their products. 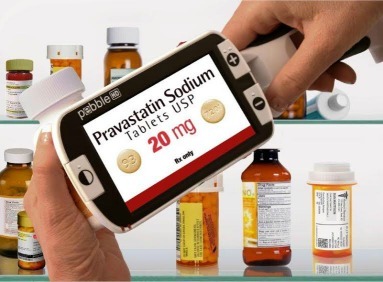 It will give you a chance to try the electronic magnifiers in your own home - try reading your own bills, prescription bottles, recipe cards, magazines, written instructions, hobbies etc.